How can you optimize your field service operations to meet rising customer demand and equip your young professionals with advanced tools and resources? 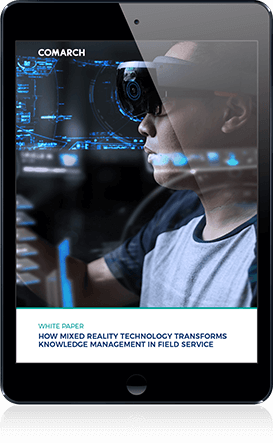 Mixed reality for field service management meets these requirements, combining knowledge exchange within your organization and enhanced “learning by doing”, while taking formerly office-bound tools out into the field and placing them in the hands of both experienced and new technicians. Comarch’s mixed reality (MR) app for Microsoft HoloLens delivers on the training and customer service levels, helping your organization to boost overall business productivity. Optimizing service delivery, knowledge sharing, training and practical field work with Comarch FSM app for Microsoft HoloLens – practical tips, examples, explanations, and possible scenarios. Download your copy of this Comarch whitepaper now.